Rumah Sakit Umum Daerah Tidar Kota Magelang - RSUD Tidar Kota Magelang or known as RSUD Tidar is a well-established state-owned general hospital in the Province of Central Java, based in Magelang Cty. RSUD Tidar is the Hospital Class B Non education based on Minister of Health Decree No 108 / Menkes / SK / II / 1995. RSUD Tidar is registered at Jl Tidar No 30 A, Kemirirejo, Magelang Tengah, Kota Magelang 56122. According to information found in the RSUD Tidar's website as cited by JobsCDC.com, RSUD Tidar Kota Magelang was originally owned by the Zending Foundation in the Dutch Colonial Period (Zendingziekenhuis), which was later inaugurated as a General Hospital on 25 May 1932, led by Dr GJ Dreckmeiers. During the Japanese occupation in Indonesia, RSUD Todar was taken over by the Japanese Government for 1 year and after the RI Proclamation of Independence in 1945. RSUD Tidar belongs to the Magelang Municipal Government. Latest passport photos (4 x 6). JobsCDC.com now available on android device. Download now on Google Play here. Please be aware of recruitment fraud. The entire stage of this selection process is free of charge. 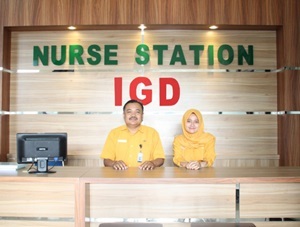 RSUD Tidar Kota Magelang - Non CPNS BLUD RSUD Tidar February 2019 will never ask for fees or upfront payments for any purposes during the recruitment process such as transportation and accommodation.